Optum has been growing faster than the company's main insurance business. The company's overall medical loss ratio fell to 81.4 percent, from 81.6 percent a year earlier. (Bloomberg) — UnitedHealth Group Inc. (NYSE:UNH), the biggest U.S. health insurer, raised its full-year forecast after saying that profit gained in the second quarter, helped by its booming Optum technology and services unit. Second-quarter net income climbed to $1.59 billion, or $1.64 a share, from $1.41 billion, or $1.42 a share, a year earlier, UnitedHealth said Thursday in a statement. That beat the average analyst estimate of $1.58 a share. UnitedHealth shares rose 2.5 percent in premarket trading in New York as of 6:39 a.m. as the company raised its forecast. Including the anticipated purchase of Catamaran Corp. (Nasdaq:CTRX), UnitedHealth now predicts earnings per share of $6.25 to $6.35, up from an earlier forecast of $6.15 to $6.30. Full-year revenue may be $154 billion, an increase from an estimate of $143 billion. 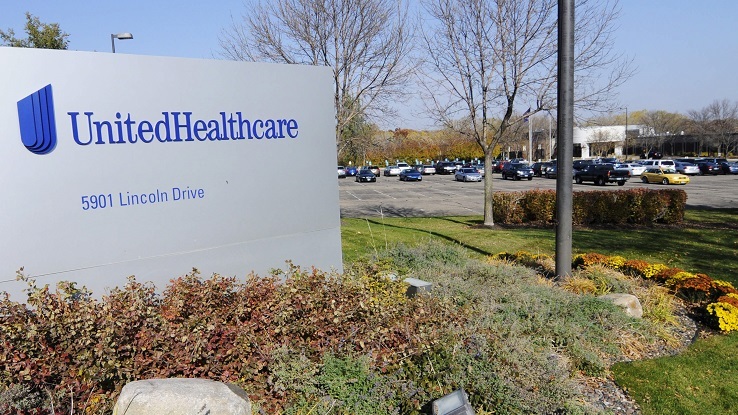 UnitedHealth is the first U.S. managed-care company to report second-quarter earnings. Investors may look to the results for clues to how the rest of the industry performed. Anthem Inc. (NYSE:ANTM), the second-largest U.S. health insurer by membership, is scheduled to post results on July 29. As the industry adjusts to regulatory changes and new customers from the Patient Protection and Affordable Care Act (PPACA), health insurers are in the midst of a consolidation wave that could reduce the number of big players to three from five. Aetna Inc. (NYSE:AET) struck a $35 billion deal this month to buy Humana Inc. (NYSE:HUM), and in June Anthem went public with an offer for Cigna Corp. (NYSE:CI). UnitedHealth hasn’t stayed on the sidelines. The Minnetonka, Minn.-based company agreed in March to acquire pharmacy benefits manager Catamaran, which would more than double the number of customers served by OptumRx, the pharmacy management unit that’s part of Optum. Optum has been growing faster than UnitedHealth’s main insurance business. The unit’s operating earnings rose 19 percent from a year earlier to $864 million, and it recorded $13.6 billion in revenue. In health insurance, UnitedHealth spent 81.4 cents of every premium dollar on patient care in the second quarter, a measure known as the medical loss ratio, compared with 81.6 cents a year earlier. Medical membership rose to 45.9 million as of June 30, from 45.8 million on March 31.